BISM Normalizer: Version 1.3.11 Released! Download it from the BISM Normalizer Visual Studio Gallery page. Support for tabular objects created by BIDS Helper. Actions are first-class objects listed in the differences grid. Display folders are attributes of other objects (tables with columns/hierarchies, measures) and visible in those objects’ definitions. Translations are attributes of other objects (tables with columns/hierarchies, measures, perspectives, actions) and visible in those objects’ definitions. 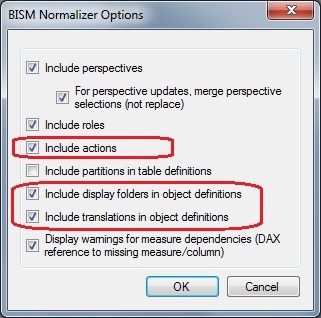 It is necessary to enable the features in the BISM Normalizer options dialog (accessible from the Connections dialog).